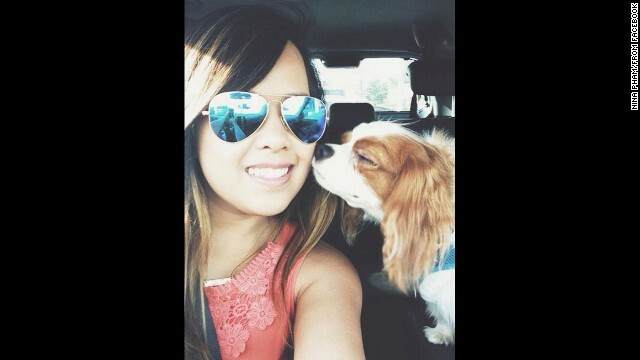 Texas nurse Nina Pham is the first person to contract Ebola in the United States. A Texas nurse who contracted Ebola has been identified. A Vatican report takes a new stance on gays and lesbians in the Catholic Church. And Kim Jong Un makes his first public appearance in over a month. Second Texas case: Something went wrong. Health officials are trying to figure out what. A nurse, who treated a dying Ebola patient in Texas, wore a mask, gown, shield and gloves, but she still got the virus. The woman, identified by CNN affiliate WFAA as Nina Pham, is the first person to have contracted the deadly virus in the United States. Yesterday, Pham got a blood transfusion from American Ebola survivor Kent Brantly. It's believed his antibodies will help her. The CDC said it's still unknown how the infection occurred, only that a "breach in protocol" for treating a patient happened. Other caregivers are being monitored for signs of infection. A shift in position: In a move that's been described as "revolutionary," a new Vatican report says the Catholic Church should welcome and appreciate gays and lesbians. The report firmly restates the church’s position that marriage is between a man and a woman. However, it notes that there are examples of good gay relationships. While Pope Francis has stayed true to Catholic teaching, he has signaled a gentler tone, famously saying in 2013, "Who am I to judge?" referring to gays and lesbians. Keeping the pressure on: Dozens of arrests marked "Moral Monday" as demonstrators across the St. Louis area protested the death of Michael Brown, an unarmed 18-year-old African-American who was fatally shot by a police officer in August. The acts of civil disobedience marked the end of a "Weekend of Resistance," designed to prompt further action in the case. Authorities say Darren Wilson, a white Ferguson, Missouri, police officer, shot Brown after he attacked him and tried to take his gun. But witnesses said the unarmed teen had his hands in the air when he was shot. Demonstrators are demanding that Wilson be charged with a crime. Oh, there you are: Kim Jong Un has reportedly made his first public appearance in more than a month. The North Korean leader gave "field guidance" to a newly built residential district and visited the Natural Energy Institute of the State Academy of Sciences, state news agency KCNA said early today. Kim hasn't been seen in public since he reportedly attended a concert with his wife on September 3. It was his longest absence from official events since he made his first public appearance in 2010, according to NK News, a website devoted to analyzing North Korea. No breakthroughs: It has been one month since student Hannah Graham was last seen. Her parents and friends at the University of Virginia, where she went to college, made pleas for help yesterday. The city of Charlottesville is now leading the search for Graham, taking over from the Department of Emergency Management. Jesse Matthew has been charged with abduction with the intent to defile in Graham's disappearance. His next court hearing is scheduled for December 4. - Zombies among us: It's never too early for a good Halloween scarecrow prank. - Cute and cuddly: A rescued fawn and kitten become best buds. - Drone-eye view: Here's a great view of Lake Champlain in Vermont. - Tell us about it: A bulldog pup practices its howling skills, as pitiful as they are. - Cutting corners: An Englishman starts his own toll road. Did he have permission? That's another story. I can't even begin to imagine the agony and the heartache that the parents of Hannah Graham who has been missing for one month and a day are enduring. It has to be hell on earth. And the man last seen with Hannah doesn't have another court hearing until December 4, 2014. Enough already!!!!!!!! Tell her parents NOW where their daughter is so they can bring her HOME!!!!!!!! My heart aches for Hannah and her parents. Wow! This lady has contracted a deadly virus, and you're all worried about the selfie picture?!!!!!!! Iphones camera flips the photo when it takes a pic. So Ms. Pham is the one driving and taking a selfie. Well at least sitting in her car and taking a selfie. Can't really tell if she is moving. If she was moving then she got mad skillz because she didn't wreck while taking that selfie. Recall she merely has ebola, not crash injuries. On #2, that is NOT a shift in the teaching of the Catholic Church. The Catechism clearly teaches that ALL are to be welcomed. The Church teaching is that all not joined in matrimony should remain chaste – again, not new, since the Church still defines matrimony as between a man and a woman. Leave it to liberal CNN to print what they want to hear instead of what is truly the teaching of the Church. It was Catholic Church experts that said those those, CNN only reported it. Yeah, the dog is clearly driving. So, Now that everyone knows that ebola CAN NOT be controlled easily, as the CDC first had us believe..how many more people are we/the US, going to send abroad to contract the virus, then bring it home to a helpless population? Unbelievable decision making from the very beginning. Such a decision makes the CIA's errors with the whitehouse security look admirable. There is, as the educated know, a HUGE difference in Stupid and Ignorant. The ebola decisions-STUPID. The only risk is that of people getting overly dramatic and not understanding basic science, leading to panic. Inciting panic is ignorant. Did anyone else notice, from the reflection of Ms. Pham's sunglasses in the above picture, she is definitely taking a selfie while driving? Nate-looks to me she is on the passenger side of the car ? Dean, even more alarming is that her dog is the one driving, and the dog is clearly not watching the road. Yes – clearly the dog is the one in the driver's seat.